The Cataclysm expansion in WOW added in the ability to level your guild. As the guild level, perks and items were unlocked for members to make use of. There was a cap on the amount of experience that could be earned by the guild each week. That experience was earned through members solving quests, kill bosses and PvPing. The max level was 25th. When a guild reached level 23, the cap for the day and for the week was automatically removed allowing for a group to finish the leveling to 25 as fast as they could accumulate 110 million experience points. To give some context as to the size of that number; it represents about 125 groups of 5 members in each group, killing all of the bosses in a typical heroic (i.e. harder than normal) level dungeon. On Zul'jin server there were 8 guilds, plus The Syndicate, that all turned 22 on the same day. That meant all of those guilds had the potential to turn 23 on the same day and thus all had the potential to reach 25th level first. The Syndicate made it a guild challenge to see if we could reach 25th level first and thus earn what was called a Realm First (i.e. first on your server) achievement. The World First (i.e. first across all servers) occurred several days before due to a bug that happened shortly after Cataclysm launched. A few guilds impacted by the bug which caused their guild exp to not reset. That caused them to gain several days advantage in exp that Blizzard did not fully reset when they cleaned things up. The Syndicate was not among those guilds who was impacted by the bug thus we were not in contention for the World First. E-Peen achievements are NOT something that The Syndicate does. We do not believe in tossing warm bodies after first boss kills at all costs. But we felt this was different. We felt that way because this was not about just 25 people. This was not about claiming to be l33t because we killed some pixels. Rather, this was about several HUNDRED people working as a TEAM to complete a goal. This was a LARGE group effort. It was all about TEAMWORK. And it took the better part of a week of working TOGETHER to make this happen. In short, this was a way to clearly demonstrate we are a unified, dedicated, motivated group that values our friendships and our team very highly. A) Was there enough energy? We had no firm count on who would or wouldn't show up and 250+ toons is a BIG number. It was 50% of our total toons at level 85. B) Was another guild going to race us? We learned that the answer was yes and that one guild did intend to race us. They were telling their members they had a "surprise" up their sleeves for The Syndicate. We took that to mean they planned to cheat. There was/is an exploit in one zone that could have allowed a guild to ding 25 the second the clock reset. The Syndicate refuses to use bugs, cheats and exploits so there was a couple days of tension where we were unsure if they would cheat or not. In the end, it turns out they were dedicated enough to have 2 groups running heroics but that was it. None of the other guilds with a shot had more than 5 members online at 4am. Most had 1 or none. 3am EST rolled around on Monday 4/4/11 and the server reset. Dozens of Syndicate members were logged in and began turning in the quests they had stored up. Dozens more followed over the next hour. We rapidly leveled to 24 and began the grind to 25. Heroic Dungeon crawls began to form and soon we had over a dozen Syndicate heroics scattered all over the world. They were grinding out bosses and more people logged in chars to turn in dailies. The percentages crept upwards... 10% done... 20%... and by 5:30am EST it was 87% of the way to level 25. At 6:03am EST we turned level 25! The Realm First was ours. In addition, per the site Guild Ox, we were the first guild to earn level 25 on 4/4/11 across the entire world. 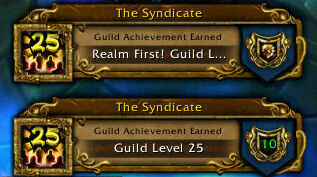 Additionally, we earned level 25 faster on 4/4 than any of the guilds that were impacted by the early Cata bug (i.e. from reset to level 25 we did that faster than anyone else). So although we will never "know for sure" since there was no direct head to head race (and other groups may have reacted differently had they been in a race), had the Cata-bug not existed early on, there is every likelihood The Syndicate would have achieved the world first. Since 4/4/11 was the first day any guild that was not impacted by the Cata-bug could have made level 25 and since The Syndicate was the first guild to earn 25 that day, we DID earn the World First among all non-bug guilds. Several hundred Syndicate members actively participated in this goal. There were still dozens of toons that could turn in dailies as they woke up and logged in, only to see we had ground out the last of the exp through heroics. There were dozens of people that intended to login, turn in and go to bed... only to stay awake and join into heroics to push us over the edge. This was a shared experience that we will be talking about for years to come. Much like the "rush" of getting a new kill in a raid, this is a "rush" that hundreds of us experienced together and that could ONLY have been achieved because several hundred of Syndies worked as a TEAM.